Time is something I rarely have with 5 kids, so when it comes to cooking I always try to come up with recipes that are easy to make and don't consume all of my time, but at the same time i want them to be flavorful and nutritious. This is by far one of my favorite recipes, its so easy to make that even my two oldest girls enjoy helping me, i hope you enjoy this refreshing Easy recipe as much as we do. In a large bowl place the chopped onions and squeeze all the lime juice over the onion, let the lime juice set aside to marinate the onion for about 10 minutes. 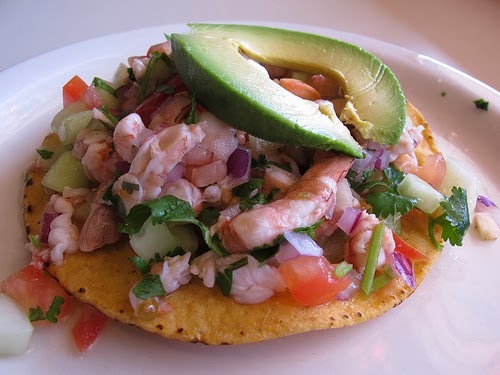 Next you are going to take the tail off the shrimp and cut the shrimps in half, then proceed to cutting the imitation crab into small and medium size squares. By now the 10 minutes probably have gone on by, you are going to add the shrimp and the crab to the lime and onion mixture, follow by the chopped cucumbers and tomatoes. Add salt to taste and sprinkle the finely chopped cilantro. Put a generous amount of this on a tostada, and garnish to taste with avocado, chili or even ketchup.